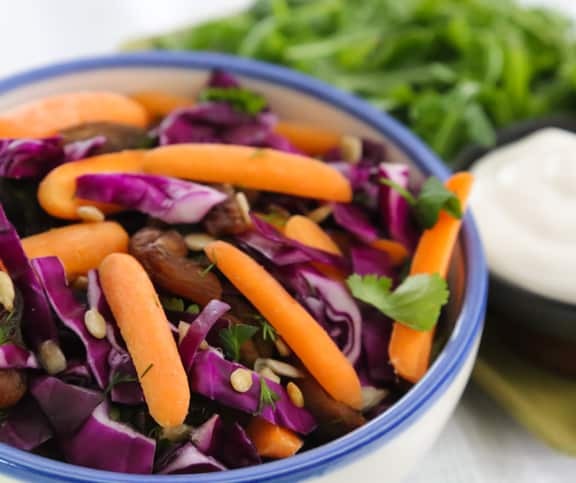 Here’s a nice change of pace from “white” coleslaw — a combination of red cabbage and carrot, sweetened with dried apricots. It adds a refreshing note to spicy meals and adds vibrant color to the plate. You can use whichever fresh herbs you like, or a combination, but I think this is particularly good with cilantro. Photos by Evan Atlas. 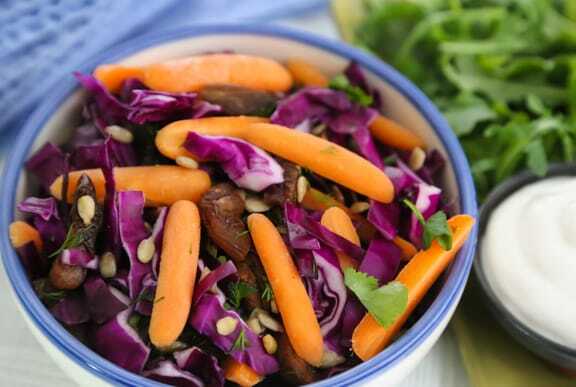 Combine the cabbage, carrots, apricots, and fresh herb(s) of your choice in a serving bowl and toss together. Combine the lime or lemon juice with the coconut yogurt and vegan mayonnaise in a small bowl and whisk together until smooth. Pour the yogurt mixture over the vegetables and toss together. Season with salt and pepper. If time allows, let the salad stand at room temperature for about 30 minutes before serving. Sprinkle the sunflower seeds onto the salad just before serving. Here are more recipes for making the most of carrots.